China has denied its new stealth fighter J-31 could take down the US F-35 joint strike fighter, but admitted challenging the latter has always been its goal. Lin Zuoming, the president of the Aviation Industry Corporation of China (AVIC) which manufactured J-31, denied in interview with CCTV that J-31 "should be able to take (the opponent model) down when it takes to the sky." Lin said that he is "fully confident" the company's chief designer has taken "the opponent model" into consideration when the J-31 was designed. The stealth fighter which was displayed in last month's air show at the Chinese city of Zhuhai created a lot buzz in the Chinese official media and Pakistan minister for defence production Rana Tanveer Hussain said Islamabad is in talks with the Beijing to acquire it for Pakistan Air Force. The J-31 fighter's chief designer, Sun Cong, said while J-31 has better performance than its US counterpart in some aspects, he admitted that it has some flaws. "Basically the model has met our expectations," state-run Global Times quoted him as saying. Lin also expressed the company's desire to change the global warplane market paradigm, which the US claims to dominate since it unveiled F-35 fighter in 2007. "The world should be balanced. Good products cannot be owned by one group," Lin said. The J-31 is the second domestically manufactured stealth fighter. Compared with the J-20 stealth fighter, the J-31 is a smaller twin-engine version. 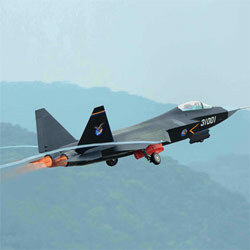 "Both the J-31 and J-20 are products of China's move to develop stealth fighters. It is unrealistic for the two models to surpass their US counterparts in a short period of time," Wang Yanan, the deputy chief editor of Aerospace Knowledge magazine, told the daily.